First Green Jewish cemetery opens | JTA - Jewish & Israel News. SAN FRANCISCO (JTA) -- The first Green Jewish cemetery in the United States was dedicated. Gan Yarok, Hebrew for "green garden" is a Jewish section of the Forever Fernwood Natural Burial Ground in Mill Valley, Calif., just north of San Francisco. It was dedicated last Friday. Rabbi Stuart Kelman, chair of the cemetery's rabbinic advisory council, says no concrete liners or embalming fluid will be used. Bodies may be buried either in plain wooden boxes, wicker baskets or just in shrouds. No pesticides or other chemicals are used on the grounds, and graves are marked by simple carved boulders instead of concrete or bronze markers. Gan Yarok includes Orthodox, Conservative and community areas, each with its own regulations. Five local congregations, from Orthodox to Renewal, have joined the Gan Yarok Association, which gives its members heavily discounted prices on burial plots. "Green Cemetery" Still Has Some Residents Concerned. It might be as organic as it gets, and one funeral home in Rockingham County [Virginia] has the OK to do it. On Wednesday night, the county board of supervisors approved Kyger Funeral Home's request to create a green cemetery. The board voted three-to-two to approve the request, but concerned residents say the slight margin only adds to their hesitation. 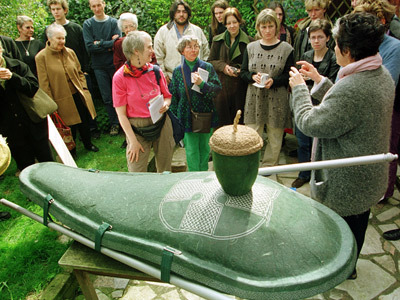 A green burial is one that uses green embalming fluids and a biodegradable casket or no casket at all. Daily Vanguard - To die a green death. Not all of us will graduate college, give birth, win a Rose Bowl or even cook a Thanksgiving dinner, but we all will eventually die. Our own mortality and that of our loved ones is not something we spend a lot of time thinking about and planning for, but it should be. We have a major taboo in our country regarding death. Our hush-hush attitude, besides being weird and unnatural, is arguably going to cause environmental problems. We cannot keep going forward with our current funeral practices without reexamination. Some in Oregon are starting to consider going green, even in death. Saying ‘good bye’ and going out green | Editorial | Coast Reporter, Sunshine Coast, BC. It must be right at the top of the list of difficult things to talk about — death. Few people cannot name at least one experience they’ve had with death that hasn’t forced them to confront their own mortality or somehow left a scar they carry with them. Usually the last aspect one might think of is the environment. But there is one man on the Sunshine Coast who is seeking to change that. Gibsons resident Don Morris presented some of his ideas to the Sunshine Coast Regional District Nov. 19, claiming it is time for us to start taking a look at the way we exit this world to see if we can’t do it a bit greener. Don is pitching the idea of green burials. Death goes green with eco-friendly burials | Oregon Environmental News - – OregonLive.com. Bruce Clark asked his family to fulfill a single last wish as he lay dying of cancer last month in his Eugene home: He wanted to be buried in a forest. The request was true to Clark's environmental values. He believed that traditional burials and even cremations use far too many resources. His family didn't possess forestland, so they gave him the next best thing, a "green burial" beside his ancestors in a pioneer cemetery. "He's in a good spot," said his sister, Megan Clark. "He would have liked it." Getting back to basics: Green burials offered at historic cemetery | Shore News Today. People from as far north as Sleepy Hollow, N.Y., make it their last wish to be laid to rest at this forested burial ground. Green burials date back to the beginning of mankind, long before anyone was being ‘green’ and long before there were other ways to bury someone. The concept is simple, go back into the earth in the most natural way possible. And to make sure Steelmantown Cemetery can only ever do green burials, Edward Bixby II had the property deed restricted. Skipton burial site's national award (From Craven Herald). Skipton’s Tarn Moor Memorial Woodland has won a national award. It has been named the best green burial site at the Cemetery of the Year Awards (CYA). Last year it finished runner-up. Burial sites were assessed on a range of criteria, including maintenance, design, facilities, freedom of memorial choice and involvement with communities. CYA awards administrator Elisabeth Edvardsen said: “The awards endeavour to increase public awareness of the importance burial sites can play within their communities. “It is our aim to give our nation’s burial sites, and the people who ensure they are kept in good condition, the recognition they deserve – celebrating those sites that make a valuable contribution to their local area. Keith Floyd buried in coffin made from banana leaves as stars pay last respects to the TV chef | Mail Online. Take a large measure of honesty, mix with humour, add a dash of irreverence and sprinkle with poignancy. Garnish with plenty of rock ’n’ roll. And to finish? Something unusual in the shape of a coffin made from banana leaves. This was the recipe for Keith Floyd’s send- off yesterday, and if he was watching somewhere he doubtless would have given it his hearty approval, smiled and had a slurp. Cemetery would break new ground in being 'green' - NewburyportNews.com, Newburyport, MA. MERRIMAC — Newburyport has its wind turbine and solar panels, but a Merrimac property owner has an environmentally friendly proposal that no town in the state can match. Bradford resident John DiBitetto wants to build the Bay State's first "green" cemetery on 35 acres off Hadley Road, land he has owned since the 1960s. "I think it's a very viable use of the land, as well as a viable use to the town," he said. DiBitetto appeared before the Planning Board earlier this month with Robert Lippe, a cemetery developer, and Carol Coan of the Funeral Consumers Alliance (FCA) of Western Massachusetts. Town Clerk Pat True said the meeting was very preliminary. Ecological burials get their day in Lafayette | jconline.com | Journal and Courier. More than 35 representatives from state, county and federal agencies attended a conference Thursday about the Green Burial Project. The conference at the Hippensteel Tribute Center included a trip to nearby Spring Vale Cemetery, which has a two-acre green site with five graves. Last fall, it became the first green cemetery in the state. The Tippecanoe County Soil & Water Conservation District was honored with the District Showcase Award by the Indiana Conservation Partnership for its efforts with Spring Vale Cemetery and Hippensteel Funeral Home and Crematory. FSPA seeks ‘natural burial’ cemetery. TOWN OF GREENFIELD - The Franciscan Sisters of Perpetual Adoration have approached La Crosse County about having a "natural burial" cemetery next to Villa St. Joseph nursing home. 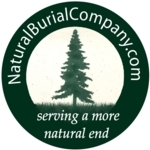 Natural burial means no burial vaults and no embalming. Sisters who choose this style likely would be wrapped in a simple shroud and "buried with all the Catholic rituals," said Sister Marlene Weisenbeck, FSPA president. "We would be wrapped or placed in a simple, biodegradable container," said Sister Sharon Berger, who has been working on natural burial issues. STEELMANTOWN-- A little known cemetery that dates back to colonial times has been restored back to its natural beauty. This Cape May County cemetery is the only in the state to practice what's known as natural burial all to preserve the beautiful forest surrounding it. Jennifer Husko takes us on a tour of this preserved sanctuary. Built over 300 years ago, the Steelmantown Cemetery located in the Steelmantown section of Upper Township lies on 9 acres of pinelands forests and is surrounded by 100's of acres of the Belleplain State Forest. "Essentially what we're walking through is a traditional burial ground that dates back to the mid 1700's," described owner, Ed Bixby. this ain't livin' » Goodness on Six Feet Under. After my discussion about content on Six Feet Under which kind of startled and upset me, I thought that it would only be fair to talk about content which pleased and excited me, because it really is a great series, even if I disliked some of the content. After all, the bits that irritated me were a tiny fraction of the whole, and it wouldn’t be entirely fair to throw the baby out with the bathwater. There’s a reason the show won numerous accolades and awards, after all. (People who haven’t seen the show should be aware that there are ample spoilers in this post!) One of the things that I really loved about the show was the depiction of natural burial and the realities of the funeral business. I loved the scene in which Nate performed a renegade natural burial for Lisa, against the wishes of her family, and Nate’s burial is an equally powerful moment in the show. The whole concept of natural burial was pretty unfamiliar for viewers when the show was airing (and probably still is for many people), and it was nice to see it portrayed in a positive way, especially on a show about death and burial which revolved around a funeral home, with a funeral director opting for a natural burial when he dies. Burial the natural way | Yakima Herald-Republic Online. GOLDENDALE, Wash. -- Ray Mitchell kept close to the earth. For years he ran Ekone Ranch, a summer camp where adults and youth stayed in earth-floor huts, learned to make fire, grow food, skin and cook buffalo and work with horses. He wanted people to connect to the earth and understand what it has to offer. To that end, he believed that our bodies do not belong to us, but to nature, said his longtime friend, Daniel Dancer. His dream was to establish a cemetery where people could return to the earth without unnatural obstructions that embalming fluid, metal caskets and concrete vaults cause. Sleepy Hollow Cemetery Expansion David Logan - Jul 24, 2009 Some residents of Sleepy Hollow Manor are opposing Sleepy Hollow Cemetery’s acquiring 12.5 acres from the Laurance Rockefeller Estate. They say they are concerned about potential environmental impacts and loss of property taxes, and have claimed that the Village’s rezoning of the land from residential to cemetery purposes was without adequate notice and illegal. I’d like to thank the River Journal for the opportunity to respond to these concerns. Christians join pagans and humanists to open woodland burial site - Communities - Beaconsfield. Christians join pagans and humanists to open woodland burial site Posted by Polly Manser on May 16, 09 12:01 AM in Beaconsfield News Leaders of 11 faiths travelled to Beaconsfield to dedicate the largest woodland burial park in the country yesterday. Set in ancient woodlands off the A40, the £3.2 million Chilterns Woodland Burial Park at Potkiln Lane opened in October and so far around 40 people are buried there. By the time it is full around 2000 people will have been laid to rest there, as part of a growing trend away from traditional funerals. Two Arlington women preach environmentalism after death - The Boston Globe. Ruth Faas and Sue Cross watched attentively as the crimson ecopod decorated with the gold Aztec sun symbol was lowered into a grave at Mount Auburn Cemetery last May. Cemetery administrators had proposed a test run with an empty casket to see how its papier-mache material, shaped like an Egyptian mummy's sarcophagus, would work with the hydraulic equipment that typically handles heavy, oblong coffins. Despite a little wobble, the conventional lift handled the 40-pound ecopod just fine - good news for Faas and Cross. Death, dying, and disposal - On Line Opinion - 10/2/2009. Is death the final frontier? The last taboo? I don’t think so. Death and dying are a very natural part of our life cycle. It may be expected or sudden, long and slow, accidental and fast; we don’t know when or how, but we do know its coming. Some people may find this a shocking revelation, others just a simple fact of life. Familiarity with death is something that has been slowly eroded from our modern lifestyles; it has been taken away from us and become big business. Green funerals bring back old ideas - Pittsburgh Tribune-Review. Some regard cemeteries as tranquil anterooms to the afterlife. Others see them as hazardous-waste sites, full of chemically treated wood and steel caskets, formaldehyde embalming fluid and concrete burial vaults. The grass could be much greener on the other side; however, say advocates of green burial, an environmentally conscious exit strategy. "The green burial involves no embalming whatsoever," says Daniel D'Alessandro, supervisor of Daniel D'Alessandro Funeral Home in Lawrenceville. "The caskets must be biodegradable with no steel, no burial vault." ABC Local - New cemetery needs natural burial options: ACT Greens. The ACT Greens are calling for any new cemetery in Canberra to include a broader range of burial options. A site near Mugga Lane has been identified as a suitable location for a third cemetery and possible crematorium. Greens MLA Caroline Le Couter says many Canberra residents are concerned about the environment in life and in death. She say she would like to see a community discussion around natural burial options which involve biodegradable coffins and shrouds. "Body is buried, you plant a tree on top of it as a memorial, rather than having a big headstone and a slab, it becomes a beautiful natural space to remember someone at," she said. Bob Smeaton from the Cemeteries Board also says he hopes natural burials can be an option in the new cemetery. "Naturally, the requirements of burial will have to be maintained but we are open-minded in terms of what options people wish to follow and we'll look to providing for those within reason," he said. Mr Smeaton says with 70 per cent of locals now choosing cremation, there is a strong case for a crematorium to be co-located with any new cemetery. He says community consultation will begin later this month and last for eight weeks. "As part of the feasibility study Canberrans will be asked to give feedback on the suitability of this location, its design and the type of cemetery they would like to see built," he said. Council to decide on proposal for natural burial plots - Local News - Taranaki Daily News. Oakura residents may soon have two choices of how they want their bodies laid to rest. The Kaitake Community Board yesterday voted in favour of developing the Oakura cemetery to include both traditional plots and space for natural burials. The proposed development would see the village's deceased right for more than 100 years with about 650 plots added to the 32 available now. How we did it ... Alternative burials give hope to woodland areas - town planning case studies - PlanningResource. With many cemeteries almost crammed to bursting point, one of the fastest growing environmental trends is for woodland burial sites. Last month Bidwells secured permission for a woodland burial park at Pitlands Wood near Beaconsfield, Buckinghamshire, the third such site it has delivered for Colney Memorial Parks. The first, at Colney Wood near Norwich, opened in 2000 and the second is under development in the Epping Forest green belt. opinion: Margaret Krome: Natural burial is a better alternative. Last month, I revisited my parents' close-to-nature weekend home in the Virginia Blue Ridge foothills. There was no place on earth that my father loved more, and in April my daughter, a sister, and I accompanied my mother there to place his ashes. When we held our memorial service in November, the stream on the property wasn't running, so it hadn't felt quite right to my mother. We waited until spring. It was sprinkling slightly that day in April, but my mother did not want to ride to the remote part of the property where she wished to spread his ashes. Walking gave us all time to reflect on the many ways that my father, Jack, felt present to us as we proceeded. The engineering projects, the native trees he loved, the invasive ones he fought. In July, when we visited again, it felt right to be there, even for my mother, even without my father. We appreciated having him memorialized nearby. Ashes to ashes, dust to dust: Preserve brings green burials to Ohio | Farm and Dairy - The Auction Guide and Rural Marketplace. Thursday, August 21, 2008 Ashes to ashes, dust to dust: Preserve brings green burials to Ohio by Andrea Zippay Get the Details Foxfield Preserve at The Wilderness Center Jennifer Quinn 9877 Alabama Ave. S.W. Wilmot, OH 44689-0202 330-763-1331 E-mail: jennifer@wildernesscenter.org Web site: www.foxfieldpreserve.org Learn more about green burial: www.greenburialcouncil.org www.memorialecosystems.com WILMOT, Ohio — Many a farmer has lived day in and day out in his or her blown-out leather work boots, holey blue jeans, and tattered shirts and hats that should have been retired long ago. And many of those same people have joked that their attire is so second-nature, so “them,” they’d be buried in their work clothes if they could. It’s a good option and downright encouraged at the new Foxfield Preserve, a nature preserve cemetery at the southwestern tip of Stark County, where green burial is the only way to go. 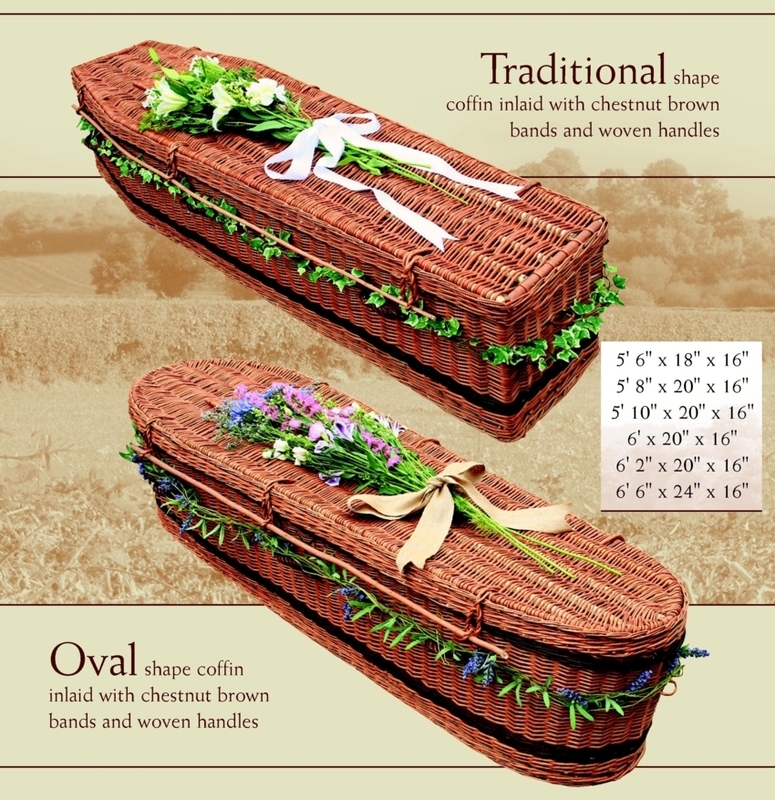 The Picayune Item - Alternative to traditional burial gains popularity. Green burial can mean either cremation or a burial with no embalming, placing the deceased in a biodegradable wooden box or a shroud. No casket or vault are used. It is an alternative to traditional funerals that is gaining in popularity. Worldwide, many are choosing green burials as more personal and environmentally friendly goodbyes. Demand up for Earth-friendly options - MLive.com. Demand up for Earth-friendly options Sunday, September 21, 2008 BY TRACY DAVIS The Ann Arbor News It makes sense that a person with environmental sensibilities would want their last wishes to reflect a green-conscious lifestyle. One of Clark County's oldest cemeteries is reviving a pioneer-era style of burial, in the hopes of appealing to modern environmental sensibilities. Local News | Cemetery a pioneer in green burial trend | Seattle Times Newspaper. FERN PRAIRIE — One of Clark County's oldest cemeteries is reviving a pioneer-era style of burial, in the hopes of appealing to modern environmental sensibilities. Near the shadow of a grove of towering oaks, two graves stand out among hundreds of others scattered throughout the bucolic setting north of Camas. Each of those graves is topped by a mound of bare dirt surrounded by a frame of 2-by-6-inch boards. As the coffins and their contents decompose, the mound will settle. "As soon as it goes down, I'll smooth it out and plant it just like everything else around here," said William Zalpys, the cemetery district commissioner who introduced the idea and began offering the service earlier this year. 'Green' cemetery would help departed get back to nature | ajc.com. Jim Bell of Milton envisions a way to keep his pasture green and enhance city efforts to buy and develop park land — only it involves a different approach to dealing with dead people. Back to the earth - Faith & Values - Kentucky.com. Green Revolution Hits Dead End In Georgia Cemetery Proposal - WSJ.com. MACON, Ga. -- Elizabeth Collins, a gardener, birdwatcher and a self-described "renaissance woman," wanted to start a "natural" cemetery where bodies would be buried without embalming, coffins or vaults. She and a partner bought a plot of land here and wrote a business plan that identified pagans, "old hippies," penny pinchers, environmentalists and Muslims -- who traditionally bury the dead without caskets -- as their target market. There would be room for 7,500 customers. Dead pets would be welcome, too. The idea didn't sit well with the living. Many residents in this socially conservative rural patch of central Georgia worried the cemetery would contaminate their water supply. Some also objected in principle to unconventional burial practices. So on Nov. 4, the Macon-Bibb County commissioners killed the cemetery plan by voting in a new ordinance that requires a "leak-proof casket or vault" for burials. It became one of the first legal moves against a growing brand of environmentalism that is entering the graveyard. Advocates of natural, or "green," cemeteries say conventional burials pollute the earth with embalming chemicals, disturb the land and waste energy in the production and transport of coffins and vaults. "People who go to Whole Foods or Wild Oats are going to expect to have green offerings in a funeral home," says Darren Crouch, whose company, Passages International, makes biodegradable funeral supplies. Mr. Crouch says sales in 2008 were up 40% from 2007. In the U.S., there are about 14 environmentally friendly cemeteries, up from just one a decade ago, and a few dozen more are in development, according to the Green Burial Council, a nonprofit that was established in 2005 and certifies sustainable cemeteries. "I get a lot of calls from people thinking it's a groovy alternative to opening a bed-and-breakfast," says council director Joe Sehee. Traditional funeral directors, who make money selling coffins and embalming services, have been ambivalent about green burials. But some say they don't want to miss out on the opportunity, as many in the business did when cremation took off a generation ago. In 2007, The Director, the monthly magazine of the National Funeral Directors Association, featured a cover story titled "Margins lean? Consider green." Northfield couple considers a 'dust to dust' greener burial. After her father suffered a stroke, Robin Nash invited him to come to live at her Northfield home. Nash and hospice nurses cared for him at the house as an alternative to a nursing home. Britons dying for green burials - Yahoo! News. LONDON (AFP) – UK residents are increasingly choosing "green" burial plots as their final resting place for ecological reasons and as space in more formal cemeteries fills up, experts say. Whether in the shade of an oak or in the middle of a flowery meadow, more and more people are planning for a "natural" funeral as they plan their final journey. "There are more than 200 natural burial grounds in the UK," said Andy Clayden, a senior lecturer at Sheffield University and member of a research team on the development of natural burial sites in Britain. "The forecast is that more sites are going to open," he said, noting that the first natural burial site was opened in 1994 in Carlisle, northwest England, and 10 years later there were 150. Going green - all the way to the grave | Philadelphia Inquirer | 11/17/2008. As the setting sun filtered through red and yellow leaves, West Laurel Hill Cemetery's Nevin Mann stuck a shovel in the ground. He was planting a tree. And, in a way, nurturing the seed of an idea: a shift in the American way of death - a departure from chemicals, concrete vaults and manicured plots. Mann, cemetery president and CEO, was ceremoniously opening a 31/2-acre "natural" burial ground at the 1869 Lower Merion cemetery, where 100,000 people are buried, including a Titanic survivor and sculptor Alexander Stirling Calder. No embalmed bodies will be allowed in this area, which has room for 400. Only untreated wood and biodegradable shrouds can be used. Ohio 'green' cemetery graveyard of future? Ohio 'green' cemetery graveyard of future?. WILMOT, Ohio -- Atop a hillside in the Sugar Creek Valley, Gordon Maupin trains binoculars on a blue jay as it lands on a tree; a flock of cedar waxwings flies past him. At the simple entrance to this former farm, an engraved stone perched on boulders says "Foxfield Preserve." What you see on these 43 acres are rolling hills, wildflowers, tall trees and sky. What you don't see is that it's also the nation's first nature preserve cemetery operated by a conservation group. Essentially, it may be the cemetery of the future. There are no marble monuments or wrought-iron gates, no groundskeeper in sight. wcco.com - Some Who Live Green Also Want To Die Green. The move to go green has gone well beyond reduce, reuse and recycle. It now includes a final resting place. In her 62 years, Nancy Manahan has had some time to figure out how she wants to live, but lately she's focused on what happens when she dies. Manahan lost her sister-in-law to breast cancer a few years ago. Instead of a fancy casket and concrete burial vault, Diane planned a very personal goodbye: She was washed by her relatives then cremated. Manahan wants to take her own last statement one step further. "I would just like to be wrapped in a simple, bio-degradable shroud of some sort. Like a cotton sheet would be fine. And as quickly as possible returned to the earth from which I came," she said. Right now that return to the earth isn't possible in Minnesota or anywhere in the Midwest. Theresa Purcell is part of a new group in the state looking for land to change that. "Green burial is so important because you're not putting toxic chemicals into the ground and you're not using up valuable resources," Purcell said. Technology has obviously changed in the last 100 years. Machinery makes grave-digging much easier now. But to be considered green, graves are once again dug by hand, burial vaults are eschewed, and a body isn't embalmed or cremated because of the chemicals involved in the process. Supporters say it's a return to the past that's just as safe as the way things are done today. Washburn-McReavy has four traditional cemeteries in the metro. 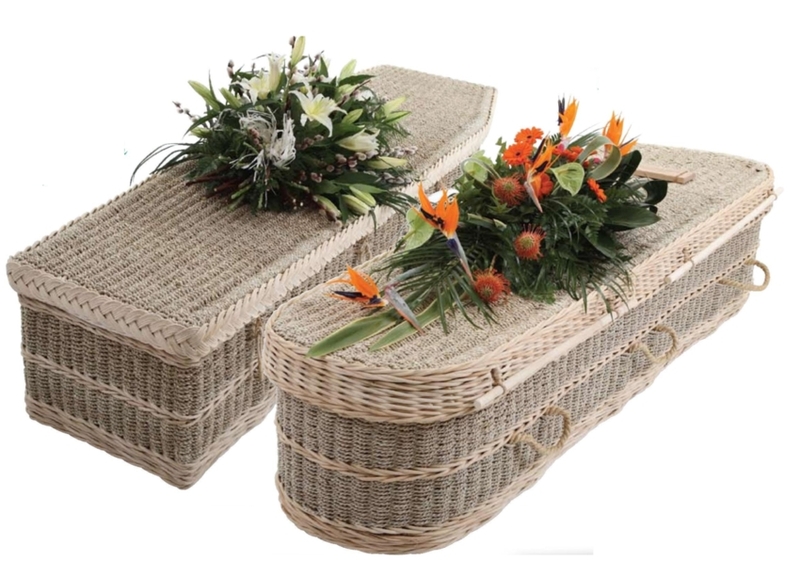 As a company, it's offering more planet-friendly products like cardboard coffins and biodegradable burial urns. "There's no evidence that shows the environment's adversely affected by having the type of cemetery that we are operating," Bill McReavy said. Instead of typical plots and stones made of marble or granite, natural burial grounds look more like parks. A rock, a tree or even GPS coordinates can mark a grave. Cost is another factor for those hoping to pass away green. The National Funeral Directors' Association puts the average cost of a traditional funeral at more than $6,500. A green burial can cost anywhere from a few hundred to a couple thousand dollars. Link: A bad case of the Humans � Neuroanthropology. Let’s imagine your name is Gaia, you’re a planet and you have a bad case of the humans. For many years you lived in symbiosis with humans, but then they evolved exogenetically, adapted in ways you were unprepared for and started to multiply in extraordinary numbers. Suddenly, the delicate balance of bacteria in your ecological gut got out of whack and now you have a bad case of gas, greenhouse gas! And no Rennie tablet is going to get you out of this one. More consider environmentally friendly funerals | Freep.com | Detroit Free Press. 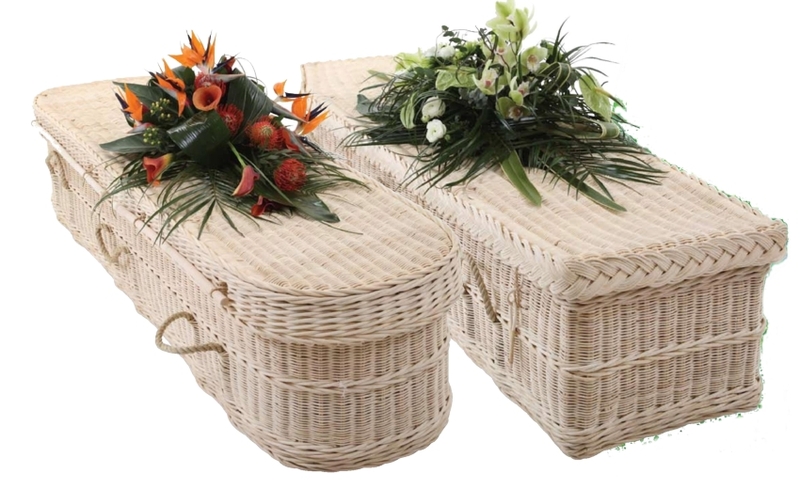 Link: Halifax News Net: News | Biodegradable caskets part of eco-burials. Pleasant Hill Cemetery in Lower Sackville now offers a burial option for environmentally-conscious consumers seeking "greener" pastures for their final resting place. This month, the non-denominational cemetery owners began selling lots in the new environmentally- friendly burial section. Eco-burials in the "Evergreen" section of the cemetery will be simpler and have less environmental impact than traditional burials. "I've been looking at this for quite awhile. I noticed it has gone over big in England and a few places in the States," explained Bill Mont, president of Pleasant Hill Cemetery. "I'm the first in Atlantic Canada to offer this, and I am pretty sure I'm the first in Canada to have officially opened this kind of cemetery." Link: New forested cemetery allows for calm, gentle reflection, greener burial | news-press.com | The News-Press. ALLENTOWN, Pa. - The sky is blue, the early-morning air is crisp, and you inhale deeply before walking into the forest. Memories - along with a soft padding of moss, grass and soil - cushion each step. You find the tree you've come to easily recognize. You tell your loved ones, whose cremated remains are buried below, that you miss them. This type of "cemetery" visit is the vision behind EcoEternity, a German company that uses biodegradable urns instead of caskets and mature trees instead of granite headstones. This week, a portion of forest in Monroe County, Pa.'s Barrett Township is becoming the second EcoEternity cemetery in the United States to offer this type of burial, a long-popular choice in countries such as Germany and Switzerland and in parts of Asia. Link: When you go, now you can go green. WILMOT, OH- Forget for a moment how you think a cemetery should look. Manicured lawns, urns of artificial flowers, and rows of headstones are gone. The Wilderness Center is taking its mission of land conservation to the next level by introducing Foxfield Preserve, the only nature preserve cemetery in the United States operated by a nonprofit conservation center. Link: Now, You Too Can Be A Tree! :: Sustainability Law Blog. Now, You Too Can Be A Tree! Did you ever wonder what's buried in a cemetery – besides dead bodies? According to Michael d' Estries in a March 25 post in Green Living, "The average cemetery buries 1,000 gallons of embalming fluid, 97.5 tons of steel, 2,028 tons of concrete, and 56,250 board feet of high quality wood in just one acre of green." I don't know what's scarier, dead bodies or 1,000 gallons of embalming fluid. Ashes to ashes, dust to dust – apparently not. Link: Muir cemetery offers state's first 'green burial' site | lansingstatejournal.com | Lansing State Journal. Chel Lea said she wants to leave this world as naturally as she entered it. She's not interested in the conventional funeral with a metal casket in which she will be embalmed. Nor is she interested in cremation. Lea, 38, of Ionia, said a "green burial" would be a perfect fit. "My body is being put back into the earth in which it came from," she said. "It will be a natural process rather than a human process. I came into this world naturally and I want to go out as natural as possible." Link: News - City's New Natural Cemetery Officially Opened. Wellington's new Natural Cemetery - part of Makara Cemetery – was officially opened by Mayor Kerry Prendergast on Tuesday 3 June. Wellington is the first place in the country where people can opt to have a completely natural burial thanks to a partnership between the City Council and the not-for-profit organisation, Natural Burials. The first natural burial has already taken place. LandscapeOnline.com :: Article : Natural Burial Cemetery Proposed. A small rural community an hour and a half northwest of Toronto soon could be home to a natural burial cemetery—where people are laid to rest without embalming, a casket or a headstone. “We’re using native plant material as part of the memorial to create a protected green space,” said Mike Salisbury, co-founder of The Natural Burial Cooperative Inc. “I don’t know if I’d want to live beside a conventional cemetery, but in this case it’s going to be a forest with maintained pathways,” he said. A 100-acre private property along the banks of the Saugeen River in Paisley, Ont., is the proposed site for the cemetery. Green' burials transform the death care industry By Jeff Green For StatelineBusiness John Bucci, owner and funeral director of the Wisconsin Chapels and Cremation Society in Verona, is a maverick of sorts. He is a funeral director with a personality. He doesn't pretend the funeral business isn't a business. And, if you call the Green Burial Council's toll-free number, he's likely the person they would put you in touch with. He's been in the business for 10 years and has been a green advocate for the last three. Bucci, 59, is insistent on making services personable, affordable and not wasteful. "I take a family at the lowest point of their life and I take care of that. I don't worry about the money. I try to diminish the stress," he said. :: TheSouthern.com - Southern Illinois' Homepage ::. JOHNSTON CITY - Southern Illinois residents can find a green lining for their burial plans. A natural burial, according to www.greenburials.org, is a burial that aims to bring the deceased as close to nature as possible. The person is wrapped in a cloth, perhaps a favorite blanket, and buried without any enclosure. In this way, they decompose and become part of the earth. "There are cemeteries, that if someone wanted to be buried like that, there is nothing to keep them from being," said Raymond Savant, funeral director and owner at Murman & Wilson Funeral Home, in Johnston City. "Most of the cemeteries in this area don't allow that. There are some that would, but the city cemeteries require at least a concrete grave liner to be put in before a person is buried." Savant said he has never had the request for a natural burial but said, to his knowledge, it is not against state law. The Illinois Burial of Dead Bodies Act states that any person not being buried in an enclosed container must be covered by at least 18 inches of earth, at the shallowest location, over the receptacle in which their remains are placed. The law does not define a receptacle. Mike Burke, owner of Riggin-Pillatsch Funeral Home in Carterville, said he believes the state requires that there must be an "outer container" involved in burial. "We'll do anything the family asks us to do, as long as it is within the law," he said. "I know it (natural burial) is becoming bigger more in California and Florida. I haven't heard too much about it around here. Out there, they wrap the body in a shroud and put it in the ground." "We have what we call an immediate burial, where we remove the individual from wherever they pass away, and do our paperwork," Savant said. "We don't embalm them. We get the grave open and take them to the cemetery and bury them." Savant said, when he performs those types of burials, he still puts the bodies into an enclosed container. "We put them into some kind of container," he said. "It might be as cheap as a cardboard box, but we don't just wrap them in a sheet and put them in the grave." The first natural cemetery was established in the United Kingdom in 1993, according to www.naturalburials.com. The site says there were more than 100 natural cemeteries in the UK by 2003. There's also cremation and spreading of ashes, which some advocates point out does not require an investment in real estate.